Dr. Munson received his B.A. degree from Augustana College in Sioux Falls, South Dakota, in 1987. After studying one year in Munich, Germany, on a Fulbright Fellowship, he received his PhD in 1993 from Texas A&M University and was a postdoctoral fellow at the University of California, Berkeley in 1994. He was in the Chemistry Department at the University of Minnesota before moving in 2001 to the Pharmaceutical Chemistry Department at the University of Kansas, and finally to the Pharmaceutical Sciences Department at the University of Kentucky in 2010. His research program is focused on the characterization of pharmaceutical solids using a variety of analytical techniques, with an emphasis on solid-state NMR spectroscopy. 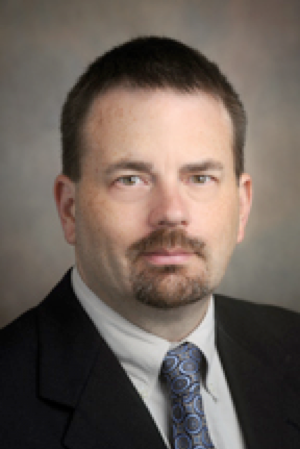 Dr. Munson is a coinventor on two patents and has published more than 100 research, review, and book chapters. He is currently a PI on two NSF grants, and is an international leader in pharmaceutics. He has served twice as chair of the faculty committee for the National Institute for Pharmaceutical Technology and Education (NIPTE), is active in the American Association of Pharmaceutical Scientists (AAPS) and serves on the Council of Experts for the United States Pharmacopeia (USP).